At some point early in our paddling lives, perhaps when we find ourselves approaching the end of a long paddling day but still a few miles from the takeout, we get to wondering. And so the ancient art of paddle-camping is rediscovered. But be careful; it was exactly this sort of fanciful reasoning that caused many a voyageur and mountain man to head for the woods, never to be seen again. Following are some tips and pointers to help make your own overnight kayak-camping adventures a bit more enjoyable. If you’ve recently made the transition from car camping, you may wonder where in your kayak to stow the cast-iron Dutch oven, chaise lounge, and beer cooler. Kayak camping is not as restrictive as backpacking, but almost. Even much of your favorite gear that is easily swallowed by a canoe will have to be left behind when kayak camping, so some strict discipline is in order. You’ll probably find it easier to use lots of smaller drybags instead of a few larger bags, to better adapt to the oddly-shaped interior of most kayaks. Your bags should be color coded for organization, and perhaps even labeled with identifying tags. Heavy vinyl bags are alright for food, as they are more resistant to puncture and probably allow less bear-attracting odor to waft through the woods, but they stubbornly stick to one another when packing into the boat. Most of my favorite bags are instead made of lightweight nylon or polyester fabric with an internal rubberized waterproof coating. Though perhaps requiring a bit more care to prevent punctures, these bags easily slide past one another when jammed into a cargo compartment, making packing more efficient. As you close each drybag, be sure to squeeze out as much air as possible before rolling down the neck seal, to conserve precious space inside your compartments. Heavier items like food and water should be packed near the middle of your kayak, preferably just behind the rear bulkhead, while lighter, bulky items like sleeping bags and clothing get packed toward the ends. Everything should be packed low and centered from side-to-side, to keep your boat stable and balanced. The only exception to these general rules is if you need to re-trim a boat for better handling. When one of my paddling partner’s skeg cable broke halfway through a trip, he wisely loaded his boat a little stern-heavy the following days, to alleviate weathercocking. A few days before your first overnighter, try test-packing your kayak to see if all your intended gear will indeed fit. It probably won’t. As you choose items that won’t make the trip, just remind yourself that the whole purpose of kayak camping is to get away from it all. 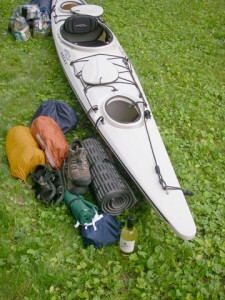 I offer below my current personal packing list, suitable for multi-day, self-supported sea-kayak trips on the Great Lakes or inland waterways. I am constantly tinkering with this list, as evidenced by the revision number above, and will post new ones here as they evolve. You will undoubtedly wonder about certain items on my list (“A candle lantern? No GPS? What are you, Amish?”). So by all means, feel free to add and delete gear to make it your own personal packing list. Believe it or not, all this stuff fits through the hatches of 14- to 18-foot sea kayaks, though sometimes I wonder how. If you’re paddling with others, there is no need to duplicate some of the equipment such as tents and cookware, but it’s often wise to have a spare stove or water filter, so use your best judgment, and hit the water! Kayak with all hatch covers, etc. I have found that an axe is an essential item when overnight camping anytime. I always have one in the bottom of my front hatch. Yes, if you plan to enjoy a campfire for cooking, etc., a small axe or hatchet, and perhaps even a small bow saw are important. I have Kakak camped on lake islands and the Arkansas River system for the last several years. Looking over this list I see it is fairly close to what has evolved into my camp set up. I would add, underwater sealing epoxy, a roll of duct tape, a roll of light gauge wire cable and a few light shackles. I have a 17 foot sea kayak with a rudder. The Cable and shackles are for repair of rudder cables. The epoxy and duct tape is in case of a breach in the hull. This has never happened as of yet. Still when several miles from land, you kayak is your life raft. Vigilance and preparation is absoluey needful. I have had two aquaintaces who died at sea in central California. One certaninly by shark attack and the other was lost with only his EPIRB and PFD found miles out. I am happiest when on large waters. In fact, I recently posted an article on making an emergency boat-repair kit, which would certainly include the items you mention. Of course, everyone’s kayak or canoe is different, so any such repair kit should be customized to your own needs, but it never hurts to have additional supplies to help fix someone else’s boat! You may also appreciate my article on “A Paddler’s Bailout Bag”, for ideas on how to fix YOURSELF in case of an accident. I agree with your add-ons Greg. Awesome list! Though I don’t have a ‘sea’ kayak, and stay pretty local because of my job (blah), I’m so excited at the idea of camping out of my kayak!! I’m thinking about hitting the Kinzua Reservior this summer! YAY! Stop on by Kayak Lovers Anonymous on facebook and check out our kayak lovers!! Will be sharing your page as well. Hope you don’t mind!! Safe paddling! Sharon, yes many of the items listed here will work just as well for other camping too, on inland lakes, rivers, etc.. Of course, you’ll want to tailor it to your own style of camping, but it should be a good place to start. Looks like lots of good paddling to be had on the Kinzua Reservoir! Will definitely check out your Kayak Lovers Anonymous Facebook page. I’m new to kayaking and i do venture out where is that river that you speak of? At the end of September I’ll wet my boat in Macon Ga and paddle down to Darien Ga. This will be my first long paddle. I am so excited to do this. September can’t get here fast enought. Your packing list is most helpful, thank you!! Ron, that’s quite a paddle! The Ocmulgee & Altamaha(?) are some real twisty rivers; looks like 300+ miles to the Atlantic Ocean. How long do you figure it’ll take you? Hey Jeff. It took 15 days for this paddle. I’ve done four more. 143 miles on the Satilla, 152 on the Oconee to the Altamaha, 93 on the Altamaha And I’m planning my next trip September 23 back to the Oconee. Also adding to your list. A usb battery charger at least 50000mah will give you at least three maybe for full phone charges. Ron, sounds like you’ve been racking up the miles! And thanks for the suggestion of a USB charger; as more of us take digital devices on our trips, USB and solar chargers become valuable tools on our trips. I live at the at the start of the Altamaha and will be kayaking from here to Darien next weekend! This was a great list to start forming my own. Thanks! That’s a lot of unrestricted river to paddle; sounds like a great trip! Hope the list helps, and check back to let us know of any other ideas you learn. Thanks for the comprehensive list! We are planning a 3 day paddle on the Ozark Scenic Riverway in MO, and this has been very helpful just trying to get my thoughts organized. Normally we are car camping people, but this trip will be more of an adventure! I’ve only driven over the Ozark River, but it looks like some great paddling! Obviously, you’ll want to adapt my list to suit your own needs/preferance, but it should be a good place to start. One thing you didn’t put in the list that may be very helpful for survival campers is a small fishing kit. Rod, reel, hooks, jig heads and some lures or soft plastics to be loaded on to catch your own meals. One of my favorite part of camping is trying to live off the land/water while I’m out. But great list otherwise. Tommy, good suggestion! I suppose I neglected to mention some simple fishing gear because I don’t fish myself, but certainly many paddlers do, and would be able to catch a meal in a pinch. While i do agree with a small fishing setup, it should not be your only source of food for if you cant catch fish you will need some other form of sustenance. I think you are a bit mistaken on the need for smaller bags. The reason for small bags is they will fit through the hatches, not because they are more efficient. If you have a kayak without bulkheads or have decent sized hatches, it is better (IMHO) to use fewer large bags. One large well fitting bag wastes less space than several smaller bags with all the gaps around them. But the big win comes with loading and unloading the boat. Remember tide (and current changes) wait for no person. And sometimes the camp site is a bit of a distance from the kayak haul-up (thinking of Pirates Cove in the Gulf Islands, BC) I’d rather bring two or three large bags (large doesn’t need to mean heavy) up than go back and forth for several trips to get small bags. Now I have one bag for clothes/electronics, one bag for shelter, one bag for food and one for odds and ends. Sure, you can carry a duffle bag to haul all the little bags to camp in one carry. And you can then use that duffle bag to hang your food bags. Note, though you can suspend your food directly from the dry bag it’s in, those dry bag seams were not designed to hold that kind of weight in the air (don’t ask me how I learned that). But over all, my load/unload times have gotten steadily faster as the number of bags (not necessarily the amount of “stuff”) has gotten smaller. My Kayak is like a station wagon compared to todays boats. I measured the inside hull diameter and bought duffle and top open dry bags that just fit. Much easier to load, easier to find stuff (color coding bags only works so far), less chance of leaving things behind (few pieces). Taken by itself, a larger single bag is indeed more space-efficient than two smaller bags. But we’re not just packing bags here, but also a kayak. If one loads a kayak with the largest bags able to fit through the hatches, there will inevitably be large spaces between and around them——wasted space, unless one is able to pack smaller gear bags into that space. Especially in the oddly-shaped interior of a kayak, a better use of space can be had by using numerous medium and small bags vs. a few large bags. Mathematicians studying geometry refer to this as “volumetric packing efficiency.” Say you’re planning a party and you want to chill 5 cases of beer. You might easily be able to shove 2-3 large intact cases of beer into the fridge, but unable to fit the others in. But if you remove all the cans/bottles from their large bulky cases and instead pack them all in there individually, you’ll fit a lot more beer in the fridge. Using more, smaller bags also makes it easier to organize and retrieve individual bits of your camping gear, rather than trying to extricate a pocketknife or a pair of socks from the depths of a large duffel. Though I always enjoy a bit of beachside scientific debate (especially one involving beer), I’ll gladly grant that if your system works better for you, by all means enjoy it! Jeff, as I was thinking of your system again, and thinking about your beer analogy, and the weight of cans and bottles, I have to tip my hat to one advantage of SBL (small bag loading). When it comes to trimming the boat, with smaller bags, you do have more flexibility in adjusting the weight balance; especially on longer trips. I find in those situation that the original heavy components – water and food – get diminished and what was lighter items – clothes and shelter – become the heaviest. So what starts out in the stern may return in the bow and vice versa. Too bad we can’t attach pictures. I’d post my “Kayak loading, the early years.” photo. I recall coming in from a multi-day trip with a pile of gear – a bit of which was lashed to the top deck. One spectator came up to me and said, “You must be a pro to pack all that stuff.” I told her that if I were a pro, all that stuff would be in the boat, not “on” it. Paul, yes trimming is very important. I generally pack heavy items like food, water (and beer!) as close to the cockpit as possible—usually just behind the rear bulkhead—so that as their weights are reduced thru the trip, they have little effect on the trim and balance. I agree that all gear should be IN the boat, not ON it, and that’s usually my limiting factor: if it doesn’t fit, it stays home! I have modified my yak to allow one boundary pack to slide behind my seat. I removed the stock seat and use a stadium seat. I also use it in the campsite. My yak is not like most yaks as it is a 1995 Wilderness Systems Chesapeake fiberglass and weighs 36 pounds. I built a yoke to clamp on the coaming. All my portages are done in one trip! Sounds like a slick setup! The few times we’ve done portages with our kayaks were considerably more hassle than portaging a canoe, but your system sounds like it makes short work of it! Thanks Jeff. It took a long time to figure things out. Last winter I put my yak in the basement to plan the set-up. I packed and repacked numerous times to make things work. I actually got my pack down to 25 pounds! I eliminated my gas fired stove and replaced it with a wood burning Solo Stove. This eliminated the need to carry the canisters of fuel. It consumes a lot of time trying to decide what you really and truly need to take. I try to resist any temptation of bringing comfort items such as a saw or cooler. I actually dehydrate my own food! All this talk is not helping my CABIN FEVER! Yes, I am forever tinkering with my own ‘kit’ of gear, and trying to shave down the bulk; I’m envious of your 25 lb. weight! The days are already growing longer, so paddling can’t be far away …! I once had a kayak that had the front and rear hatches and had to pack the small bags. To make the portages I had to unload everything and pack it into an army duffle bag. Taking multiple trips is a drag and time consuming. I had to lighten the load as I am going on 66 years of age! I found a helpful web site called http://www.maddythegoose.com. Check it out! Neville, you raise a good point regarding adapting one’s gear/kit to the boat. Paul above describes his kayak as a bit more voluminous, so his larger bags work well for him. My boat is narrower and probably faster, but I sacrifice a good bit of space for that speed, which compels me to pack gear in tighter. Glad to have you join us from the Land Down Under! Thanks everyone for an interesting discussion site. I’m always amused by the references or dry suits and bear bags, as I live on the East Coast of Australia, where we probably look similar from a distance to our mates from the northern climes, but we do it to keep the sun off, not the need to keep warm. Planning a 10 day trip down the Myall River and Myall Lakes in a few weeks. Getting cooler, but still good for swimming, and we can swim all year round in Northern NSW. Good information, I never seem to tire of reading others helpful advice. Thanks for dropping us a line from ‘down under,’ Peter! Yours is an example of how every paddler needs to adapt his technique and kit to suit his environment. Though we northern paddlers certainly need sun protection too (I burnt my nose a bit this past weekend, while kayaking among lingering ice floes), our real danger here is cold water. Sorry to hear your summer is ending just as ours is beginning; enjoy the rest of the season! This is a great list. While I like the idea of larger bags, the small ones work much better, just because of hatch size. One thing I’m a little surprised to see is that you are packing your wine in glass bottles. Most rivers I know of here in Arkansas don’t allow glass. The danger to the environment being the key focus here. 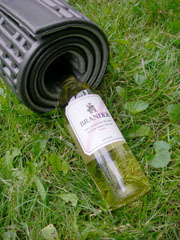 If I’m taking wine, we always decant it into a Nalgene (shatterproof and multi-use). Beer can’t be decanted, but the choices for good canned beer are much better than they used to be. To be clear: I’m not partying on the river, just unwinding after a long paddle, so the quantity is not an issue, just the glass. My $0.02 anyway…. Thanks for writing, Tim! 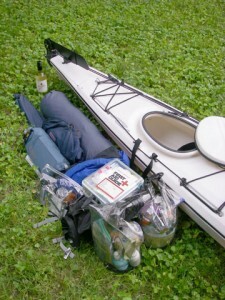 Apart from the somewhat tongue-in-cheek photo, we seldom carry wine on such kayak-touring trips, if only due to the weight. Re-usable plastic containers are better than those of the past, and carbonated beverages in aluminum cans are far more convenient, as they offer smaller serving sizes and can be compacted when emptied, with little remaining weight or bulk. And, as you say, the selection of quality beers now available in cans is quite good (thankfully)! As in Arkansas and presumably many other rivers nationwide where campers are compelled to camp near the water, our Lower Wisconsin State Riverway wisely prohibits the use of any glassware. And it should go without saying that we should all follow “The “Leave No Trace” Seven Principles for Paddlers”. I will be leaving in a week on a kayaking/backpacking trip out in the fjords of Norway. I’ve done an extensive amount of backpacking but this will be my first out-of-kayak trip so I have a question about drybag packing. For such a list, how many drybags do you require? You suggested many small bags as opposed to a few larger which makes sense not only in order to optimize the weight distribution in your kayak but just spatial constraints in general. What size small bags do you use? Are we talking 10-20L range? I’m currently using only about six 5-10-liter drybags for the packing list outlined here. But I typically only use drybags for those items which *require* complete dryness: clothing, food, electronics, first-aid kit,, etc.. I don’t bother packing less crucial gear in drybags: kitchenware, campstove, sandals, rain jacket, etc.. A two-person backpacking tent, even if completely soaked, can quickly be drip-dried and erected, and will soon dry out enough to inhabit. A sleeping bag, of course, is no place to risk wetness, esp. if goose down. I swear by this clever compression dry-sack. Myself and a group of friends will be taking an overnight camping trip with a short paddle in knubble bay Maine this coming weekend and we appreciate this primer in packing a kayak. Thanks for the great tips! Lauren, Looks like a beautiful place to kayak! An overnighter is a great way to break into kayak-camping and to work out your routine and gear list. And going with friends means you’ll probably have a backup in case someone forgets something. Glad the article helped. Have a great trip! I noticed you said the Great Lakes, I am from the Detroit area and was looking to plan a kayak camping trip with some friends, do you recommend an area? We were looking to go three days, two nights. Sort of like a kayak, make camp, wake up pack up and kayak more type of thing. Somewhere where we can put-in and take-out in different locations but all vehicles would be safe parked from start to end. Any recommendations? Anything is appreciated, it’s our first time planning this. Chelsea, congratulations on getting into kayak-camping! Living in Detroit, you’re quite close to TWO Great Lakes. Planning such a trip really depends on how far you want to drive, how far you want to paddle each day, and whether there are public lands available for camping along the way. Lake Michigan tends to offer fewer such places than Lake Superior, since so much of the shoreline is privately owned, but you can find them. What you’re talking about is called a ‘shuttle’ trip, where you drop off a car at the destination, then drive back with all boats and gear to the put-in, then paddle a few days to the first car. Then, of course, you need to drive back to pick up the second car on the way back! Mainland backcountry camping is available at the White Pine campground near the Platte River campground, or at the Valley View campground north of Glen Arbor. From maps, it looks like there may be enough public land access in this part of the shoreline to piece together a 3-day trip. By launching on the South side of the peninsula and paddling out and around the point, and back to the North shore, you could possibly do a 2-3-day trip and land quite close to your car, for a shorter shuttle. Check with the park for available campsites near the water. The Lake Michigan shore west of St. Ignace is in the Sault Ste. Marie Forest Area, which may allow backcountry/shore camping. St. Ignace to Epoufette Bay, for example, is a distance of about 27 miles, or 3 ten-mile days of paddling. We do a fair amount of Kayak Camping throughout the Adirondacks in upstate NY. ,,,my kayak weighs 60# empty, I add about 50-55# of gear. – Making a base camp and then doing day trips allows you to empty the kayaks and explore, as well as making any portages much easier. I’m sure you know that wheels don’t always work in the ADK’s. Get a lighter yak and devise ways to load it and carry it. I have a 36 # yak. Removed the factory seat. I slide my waterproof Boundary Pack under the rear deck and use a stadium seat. I can use the seat in camp also. I also built a yoke to carry it over the portages with my pack on! One trip portages are quicker than multiple trips! If you can’t use this idea, you can pack your gear in smaller bags and bring a military duffle bag to pack these smaller bags in. Install your yoke, shoulder your duffle bag and lift your yak! The duffle bag folds until you need it. Thank you for the great insight. My wife and I are planning a kayaking trip for 2 nights in the Everglades. The water there is not able to be filtered. Any thoughts on water storage? We have canoed the park and had no problem carrying a 5 gallon container. Would be a different story in a kayak. Any help would be appreciated. Expandable water-storage bags like these from Cascade Designs are a great way to carry water in a kayak (watch for an upcoming Superior Paddling product review). Lightweight, flexible, and available in a variety of sizes, these bags allow you to carry water for the changing needs of a trip, without the rigid bulk of typical camping water jugs. Have a great Everglades trip! We just finished a circumnavigation of Isle Royale and the outer loop of the Apostle Islands (170 miles) and I definitely feel multiple smaller bags is best. Trying to find just the right thing at the right time is easier if you don’t have to unpack and repack a bigger drybag. After a long paddle it isn’t easy to remember which bag has what in it. Also for lunch breaks having cooking gear organized with food prepackaged saves time and effort. I use a Jetboil and dehydrated meals but for others being able to “cook” requires an alcohol stove. Boiling water in less than a minute is great for those of us that just want something quick and filling or that rejuvenating cup of tea. Yes Scott, the organizational advantage of many smaller bags is definitely another plus when on a trip. We also try to make a point to prepare our lunches while cooking breakfast, so we don’t have to break out the cooking gear again for a lunch break. Sandwiches, wraps, and other unheated foods work well for this. Sometimes we skip a proper lunch entirely and instead simply snack perpetually between breakfast and dinner, as a way of distributing our caloric input over the course of a long paddling day. Going all the way round Isle Royale is definitely on my list! How long did it take you? Stumbled across this excellent site and discussion whilst browsing (again) for new tips and tricks while waiting for summer to come here in NZ. We can kayak year round but always get in a longer trip over the summer holidays, and I am getting impatient….. One tip to add to the list, we tend to use smaller dry bags but stash a large mesh type bag behind my seat, when we are unpacking at the end of a day, and setting up a camp we fill it with the smaller bags, thread a paddle or pole through the handles and shoulder it to the campsite. It’s also useful for hanging in a tree with damp stuff. We don’t have to worry about bears but we do put all our food back into the hatches overnight to avoid rats, mice and opossums who will make holes in food bags and tents but luckily, leave the kayaks alone. Roll on summer!!! Yes, a way to carry all those smaller bags is certainly helpful, and I like your idea of a large mesh bag, which compresses to nearly nothing when unused. Others like duffels or handled shopping bags from IKEA. Thanks for the additional tips from the southern hemisphere, Lesley! Glad to find your site. I kayak and have done several overnight trips. I am going on a 4 day 3 night trip down the Suwanne River in Florida and am finding this a challenge to pack for. Each camping trip has led me to purchase smaller, lightweight camping equipment, but food is being the challenge for me. There are no restaurants along my route!!. I have not really tried dehydration yet. If you have any tips on that – please pass them on. I have enjoyed reading the comments about small bags/large bags and have picked up some great tips. Thanks for the ideas – will have another go at packing boat again tonight to keep from carrying anything on top. I’ve hesitated to write much regarding food because individual tastes of people are so varied. It seems that touring paddlers run the gamut from the Boundary Waters style of old-time ‘traditional’ Dutch Ovens and fresh-baked sourdough biscuits & gravy, to those who eat whatever the astronauts eat on the International Space Station. My personal approach to food is much like my approach to nearly everything else for kayak-touring: Simple. And cheap. Another bagel, this time with a couple slices of summer sausage and super-hard cheddar cheese tucked inside. For dinner, my trip partners and I take turns cooking each evening, and I usually make a large packet of quick-cook flavored rice or pasta, with a can of pre-cooked chicken or tuna chunks stirred in. These provide the necessary carbohydrates for energy, and protein for muscle maintenance. Add a couple dozen granola or other snack bars for all-day munching, some powdered energy-drink mix, and the necessary water for drinking/cooking, and you have enough for a week of touring. All my food for a one-week trip fits into a 10-liter drybag, and I often come home with some unused ‘leftover’ packages. All these items are readily available at your local grocery store for little money, and require little more than a backpacking stove and cookset. Canned food is admittedly heavy, and the cans require rinsing and packing out, but they’re still far lighter than any cast-iron frying pan. And the grocery-store packets of dehydrated rice/pasta are far cheaper than the similar stuff at the backpacking shop. Next trip, I know I can leave alot of extras homes. I did snack frequently, nuts, trail mix and granola bars. Hate to say, but I did save room for small boxed wine! Good to hear you had a great trip! And learned something about your own camping-dining preferences. Better to have too much food than too little, and one never knows when one will be delayed/stranded somewhere for an extra day or two, so a ‘reserve’ is smart. Still, I often assess the remaining food I bring back from a trip to see if I can do without it next time. I keep meaning to try the pita bread, and my backpacking brother taught me a good use for tortillas: slather them with peanut butter and/or honey and roll ’em up tight like cigars, then carry them in zipper-lock baggies for snacking and lunches. He often brings a dozen such pre-made rolls for a week of paddling. My kit is stored inside a wide mouth stainless steel bottle that is not insulated and has no plastic parts…and is waterproof. I do waterproof the items inside just in case. I take a short piece of bailing wire to loop around the top so that I can boil water in it over a fire. I pack a couple tea bags also, as a warm drink can be huge out there! We are taking our first kayak trip in March. We are paddling across the state of Florida. From Stuart to Cape Coral. Your article and many of the comments I have read have been very helpful. As this is our first long trip it will, I’m sure be a learning experience for us. The trip is around 160 miles. We are planning 6 days to make the trip. With good luck and gentle tides we are looking forward to a rewarding experience. That sounds like quite a trip, in a beautiful area. Glad you found some good packing tips here, and hope you have a great trip! I am new to kayak-camping and i am looking forward to nice trips with friends and family. Thank you from Canada. Christian, welcome to the great sport of kayak-camping! Some of my earliest and best canoe-camping experiences were on family trips in Canada, and we still find some of the best paddling there. I’m sure you and your family will have a lot of fun. I am so pleased to have found this informative–and well written!–site. Thanks for all the advice. Since I usually go out on my own rather than with a group, I am particularly focused on preparedness and safety. I appreciate the detailed advice/specs, which help to make this new adventure of kayak-camping a less intimidating prospect. Thanks again for creating (and maintaining) such a helpful website. JoLee, thanks for your kind words! Glad to hear you’ve found a kayak that works for your environment and for your style of paddling and camping; whatever gets you on the water! I had a chance a few years ago to enjoy a day-paddle through some Key Largo mangrove swamps in SOTs, and they are well suited to that type of paddling. And congratulations on adapting the packing info to your boat and type of camping. Thanks for the equipment list, I am a hiking addict, but have a heal spur at present so am going to do a 5 – 6 day trip down the Murray River (Australia), next week. This section will take me through a new National Park, with giant Red Gums and loads of water birds, should be good. Just decided to go yesterday, so all the help in quickly getting it together helps! I’m a but worried about all the water I will need to carry, and the weather (it’s winter here now), but she’ll be right! Sounds like a great trip in a beautiful place! Paddling is a great way to explore the backcountry even if one has some kind of physical ailment or a disability because it is such a low-impact activity. Because the boat is carrying all the weight of you and your gear, the trip can be easier on one’s joints, etc..
Glad the packing list was helpful; have a wonderful trip! We just came back from spending 3 months kayaking the Alaska Inside Passage using our 22′ ocean tandem. We had almost all of the author’s list. We didn’t have a horn though contemplated one. We did use the DeLorme InReach Explorer which includes GPS, emergency locator, social network (if you want to keep in touch) and messaging. We also had a marine radio. We prefer the large vinyl dry bags and honesty in all our years of ocean haven’t had a problem with sticking together. On this summer’s trip we tried some of the lighter weight bags….weren’t impressed. Being prepared for anything is always very important….even if nothing happens. I have fully read this page. It is full of great advice. My husband and I are getting ready to do our first overnight trip on lake havasu as. Hopefully I will be able to convince him to do more. Thank you for all the helpful advice so every thing goes smoothly. Glad you have found the article helpful, Beth! I hope it inspires your paddling partner with the confidence he needs to ‘go outside and play’. Have a good trip on Lake Havasu! ok. so what happened to packing light. i mean thats a lot of stuff to fit in a kayak. I’m currently paddling an Impex Force Cat 4, which is a pretty fast but quite low-volume slim boat, and to be sure, it can be a task to fit all this gear into that kayak. My buddy’s Valley Aquanaut, on the other hand, is a bit wider and slower but is a real gear hound, and I often marvel at the extra luxuries he’s able to bring along. Hauling less gear around will certainly make your boat lighter, faster, and easier to pack, but at the cost of camping comfort. So each paddler must decide for him- or herself what stays and what goes. When I fly to a paddling destination and my gear volume is limited by airline restrictions, I have to trim my kit considerably. Feasible, but I do miss some of the usual creature comforts. My brother pack light and celebrate with bloody Mary’s! Beer is too heavy to carry on 1.5 mile portages over rugged terrain in the Adirondacks. We won’t mooch your beer because we’ll be drinking after our camp is set up and waiting for you to arrive! Really helpful article. I have bought a new boat and looking for the first trip. Really excited. Thanks for sharing great tips. I found this article very helpful as I start the research on one of my Bucket List items, round trip solo kayaking of the St Johns River in FL. 620 miles total. I will be starting in Jacksonville and going up river. I have RV camped for many years and have minor canoe experience, but none in a kayak. As I start to get older (I’m 78), it’s time to start on my list. I have the advantage being near civilization most of the trip, not like Alaska or the boonies of Lake Superior as many of the trips commented on were. My target date is mid-March. I don’t have much equipment yet, not even the kayak. I expect to look at several on Craigs List next week and then start practicing and seeing how much equipment it will hold. I have no deadline for this trip. If it take 2-3 months that’s OK. I would like to report on the trip periodically and would appreciate any thoughts on the best ways, blog, Facebook, website, etc. That sort of thing. Any conversation at all on my trip would be appreciated. Sounds like a fantastic trip, Jim! I’ve paddled a canoe for a bit of the St. Johns River, near Blue Spring State Park, where one could carefully paddle among the wintering manatees. Paddling the entire river, especially upstream, would be a truly epic journey! I would urge you to get your kayak and begin practicing as soon as possible, as your planned launch date is soon approaching. Pack your boat as you would for your trip and start paddling more and more miles to build your stamina and to estimate how far you are able to paddle in a typical day. As for keeping in touch while on your trip, I think Facebook is perhaps the easiest and most effective, since it would require no special domain name or webhosting, let alone the work to setup a dedicated website/blog. Facebook also offers mobile apps to allow easy posting even from a muddy riverbank while camping, as long as you have a phone or data connection. It’s also an easy way to build a following/audience. Thank you all for the input to this string. I am not a kayaker but am planning a pigramage that will take me miles up lake. I have about 8 months to pull together gear, get in shape and figure out how much nourishment I need to complete the trip. I will be making reference to these writings and taking ideas. Thanks. I have a long preparation but feel its more manageable now. As I suggested to Jim above, start practicing as soon as possible and add more miles to build your fitness level. The first trip can be the most challenging, but also the most exciting! That’s a hilarious list. I don’t carry 1/3 that crap, lol, and I stay for 1-2 days, usually. Oops I forgot: I took a hammock on my last trip, not a tent (which I regretted) so I need to add sleeping bag and air mattress to this list: I like hammocks but as I usually camp on sand bars I wound up with chiggers traipsing around in the woods rigging that CRAPPY hammock. Still, I am very drawn to hammocks (don’t like air mattresses) and I think I am going to purchase a Warbonnet this season. If one is paddling and camping in southern inland waters, you can probably forego much of the safety gear required in the open-water marine environments of the ocean or Great Lakes: cold-water immersion clothing, signal flares, tow belt, VHF marine radio, bear bags, etc.. The US Coast Guard patrols the waters we paddle precisely because they are so potentially dangerous and remote, so it would be foolhardy to kayak in such places without such crucial safety gear. But even in milder inland waters, I don’t see on your list any of the usual outdoor essentials like maps, compass, small first-aid kit, even sunglasses or a rain jacket? If we were going out for only “1-2 days”, we might get away with packing a couple of big lunches and some snacks, and sleeping in the same underwear we wore while paddling. But the 1-2-weeklong backcountry trips for which this list is used will usually benefit from a few hot meals, requiring more food and some minimalist cooking equipment. And as we can expect to encounter sweltering 90-degree days and 40-degree rainy nights, and we are often several hours or even days from ‘civilization’ and safety, self-sufficiency is crucial. As always, this list must be adapted to each paddler’s unique environment and situation. I love kayaking, and I agree that when you go out camping with one packing light is key. If you are going to be using the same campground next to your car, then you can pack your dutch oven chairs and any other niceties. However, if you are going to go on a prolonged trip you should probably pack just as carefully as you would for a backpacking trip. I think your list is a really good guide for this. Color coded bags, excellent idea. Great article! May we post a link to this on our club website. I think there are a lot of members that would find this useful. 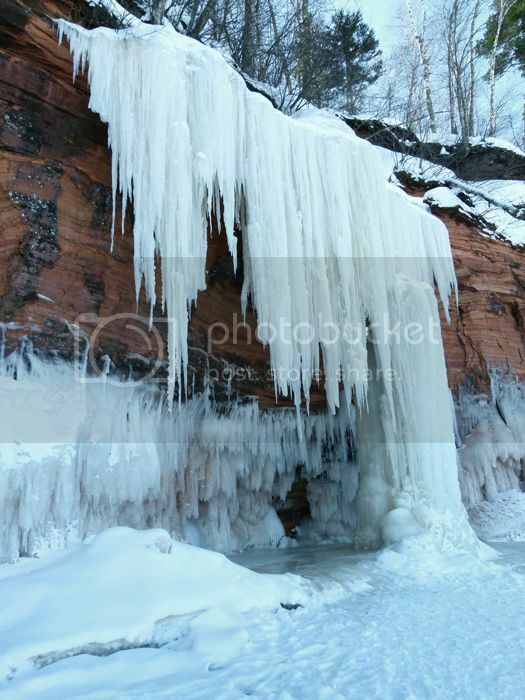 Chris, sorry for the late reply but I was out paddling last week, in Michigan’s Pictured Rocks Nat’l Lakeshore. Yes, by all means feel free to link to my article! 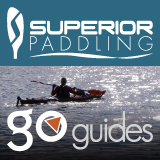 I hope your members find it helpful in planning their own canoeing and kayaking adventures. Last March (2016), I spent 3 days & 2 nights in the Okefenokee National Wildlife Refuge, (~700 square miles of wilderness with ~15,000 alligators and 120 miles of paddling trails). My solo trip was only 20 miles long that took me through each type of habitat within the refuge. Small dry bags did worked well inside the boat for packing, but I took to much gear on the deck in 2 deck bags, a soft sided kayak cooler and a large dry bag. Your advice to pre-pack your boat before the trip, I knew, but failed to carry it out before hand which resulted in the overloaded deck. I’m planning a return trip for this coming March with more care to reducing the volume by replacing some items and leaving others in the vehicle or home. The Refuge requires leave-no-trace to the point that you must pack everything out (even human waste unless the human waste is deposited in composting toilets at the campsites). This is a wildlife refuge where plants & critters are more important than the visiting people. Because of this need to limit human impact on the wildlife is so great planning your meals is very important to the point that portion size and number of meals you bring into the refuge is a major consideration in trip planning. Any food not eaten must be carried out and not left in the composting toilets, or anywhere within the refuge. Anyone who is in need of a paddling destination during the months that ice is covering your favorite northern waters should look south where there are very good open waters to explore and the boat will only look out of place on your vehicle as long as there is snow on the sides of the roads. We are planning on going on a kayak tour this summer. It’s important that we pack all the right things. I hadn’t thought of bringing a candle lantern as you suggested. Thanks for sharing! Absolutely essential if your route includes urban/rural sections is a lock and cable to secure your boat if you have to leave it unattended. I travel the Ontario canal systems, and frequently lock up my kayak when I head off to stock up in a town or at a lockstation. My kayak has a short, recessed metal rod to use to lock it up, but it is almost impossible to find a lock or cable that will fit through. My solution: I bought a gun lock which has a fine cable that slips neatly through the opening. I loop that through a standard bike cable, and hook the cable around a tree/picnic table/dock fitting/whatever. I carry the key in my life jacket and a spare (essential) in my day pack. We’ve been looking into getting some kayak guided tours, and I’d love some help. I’m glad you talked about how you should look at what you’re going to use for shelter on a guided tour. I’m going to have to look for some good kayak guided tours and see what we can find! Great site. Thanks for the guidance. I’m an experienced wilderness canoe camper planning a solo kayak lake/river trip of 8-14 days next summer in northern Maine. I’ve done a little fresh water day kayaking but am not an experienced kayaker. I’ll be buying a kayak and am surprised that there doesn’t seem to be any kayak storage volume comparison chart anywhere online. I even called Wilderness Systems help line who make Dagger & Perception kayaks also and they don’t have any such thing. Seems like an important piece of info for multi-day kayak camping. Any guidance will be greatly appreciated. Awesome packing list. What sleeping pad did you pack in/take with you? I have seen these :https://www.camp4.com/best-camping-mattress/ Do you think that the TNH would be sufficient? it seems to fold small enough to pack? Were you really able to fit this amount of kit in? Your list seems to be essential but I am not convinced that I will get it all into my kit. As for other models, it’s difficult to recommend a particular one, partly because we’re all so different in our needs and preferences, and also because of the wide variety available. The TNH appears to be one to consider, though perhaps heavier and bulkier than some others. Yes, all that gear indeed fits in my boats; one of which is a short-but-wide 14-footer, and another which is a long-but-narrow 18-footer. Though not listed, I often squeeze a 12-pack of a local brew into the rear hatch before setting out, too! Admittedly, it’s an awful lot of stuff, so you may want to split the packing list into “Must-Have Essentials” and “Maybe, If It’ll Fit”. See what fits into your kayak, and works for you. As mentioned, test-packing in the back yard will help you work out the routine. Hope this helps, and happy paddling! A little advice on portage. They make a deer slide that rolls up small. Will fit in storage area and not take up a lot of room. You can strap your bags to it and drag. Beats carrying and a lot of trips around a dam etc. I love what you said about test-packing your kayak in order to see if all of your gear will fit. I believe that having the right camping gear is imperative when it comes to enjoying your camping trip. My family is planning on going on a trip this summer, so I’ll make sure to contact a camping store that can give me a deal on the best gear on the market.